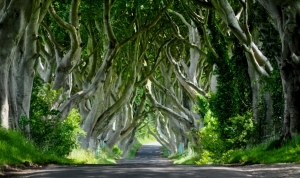 Large chunks of the exterior scenes in the hugely popular fantasy television series Game of Thrones are filmed in Northern Ireland. Many of the filming locations, such as Winterfell and Dorne, have become iconic to viewers, who nonetheless may not even be aware of where those locations are really situated. An 18th-century farmyard that served as Winterfell in the first season of the programme. The location where Bran unsuccessfully attempted to learn archery and where the King and his party were greeted by the Stark family. Tourists can visit Castle Ward, receive archery lessons from actual extras from the show, and wear costumes inspired by the programme. The castle is located southwards from the city of Belfast. A small village located in the north of Northern Ireland, south-west of Bally Castle and about a 90-minute drive from Belfast, near the river Dun. It’s home to the cave which featured in the show as the place where the shadow creature was born to Melisandre in “Garden of Bones”, the fourth episode of the second season. 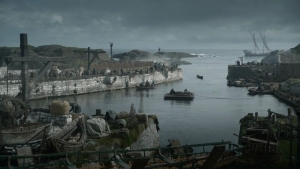 A small picturesque harbour, Carnlough was seen in a memorable scene in “The Broken Man”, episode 7 of season 6, featuring the steps crawled up by Arya Stark following her stabbing by Waif. Camlough is situated about 90 minutes drive from the northeast of Ballymena on the northern coast. A tiny fishing village, Ballintoy Beach (the name originating with the Irish phrase Baile an Tuaigh, which means “the northern townland”) was used to represent Lordsport Harbour during the programme’s second season. Its nearby beach also featured as the spot where Theon was baptised into the Drowned God religion. Another area of the beach was used again during season six. Here, Yara was reminded by Aeron Greyjoy and a priest that the Ironborn’s new ruler would be chosen at a Kingsmoot. Ballintoy can be found on the B15 coast road, which is situated 6 miles to the west of Ballycastle and 17 miles to the north-east of Coleraine. This 12th-century building featured in the tenth episode of season 1, “Fire and Blood”, as the place where the bannermen of Rob Stark rallied to the side of the leader, following their Battle of the Whispering Wood victory. Inch Abbey, which offers a spectacular view of River Quoile, is situated to the south of Belfast, around two miles to the north of Downpatrick. Other Northern Ireland filming locations include Tollymore Forest, Portstewart Stand, the Dark Hedges, Larrybane, Clandeboye estate and Audrey’s Field & Castle. Serious Game of Thrones fans are in for a treat in Northern Ireland! Odyssey Coach Tours will be adding a Game of Thrones tour soon, so keep an eye out and enjoy the experience with us.